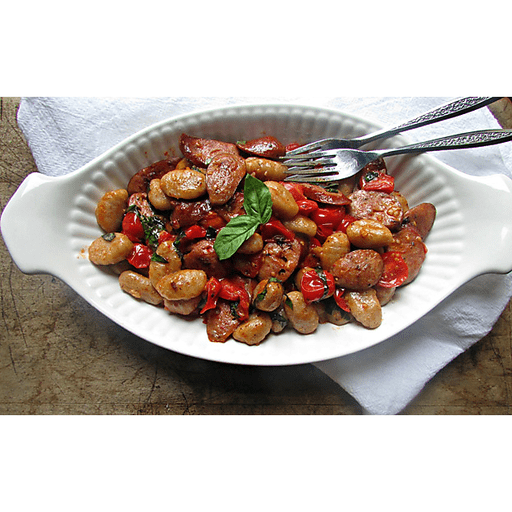 This one-dish meal is high in fiber with whole wheat gnocchi, protein-packed chicken sausage and loads of fresh tomatoes. 1. Boil water in a medium stock pot. 1. Chop cherry tomatoes in half and chiffonade fresh basil. Set aside. 1. Once water is boiling, add gnocchi and reduce heat to medium. Allow to cook until gnocchi are floating. Remove with a slotted spoon and place in a bowl. Add 1 tsp. olive oil and toss to coat. 1. Add remaining 2 tsp. olive oil to a cast iron skillet and heat to medium-high. Add chicken sausage and sauté 3-4 minutes, until starting to brown. Add tomatoes and cook 2-3 more minutes. Add gnocchi and season with salt and pepper. Toss in fresh basil. 1. Serve and enjoy! Chiffonade basil by cutting it into long, thin strips with your knife. Simply stack the basil leaves, roll them tightly and then thinly slice perpendicular to the roll. Calories 270, Total Fat 9g (Saturated 2.5g, Trans 0g), Cholesterol 40mg, Sodium 680mg, Total Carbohydrate 34g (Dietary Fiber 3g, Sugars 6g), Protein 12g, Vitamin A 20%, Vitamin C 15%, Calcium 6%, Iron 10% *Nutritional values are an approximation. Actual nutritional values may vary due to preparation techniques, variations related to suppliers, regional and seasonal differences, or rounding.